Access to this park is by active logging roads. The chance of encountering loaded logging trucks while traveling these roads is highly likely. Logging trucks have the right of way at all times. Drivers should use caution and yield to logging trucks; use pullouts whenever possible. There are several changes to public access in and around Campbell River as a result of the BC Hydro John Hart Generation Station Replacement Project. Brewster Lake Road CLOSED to all traffic (No public access across John Hart Dam from Highway 28 to access Loveland Bay) The Brewster Lake Road will be subject to a full closure to all traffic beginning April 1, 2015 for up to three years, in this location. The recognized route for public recreational traffic to access these areas follows Hwy. 19 North to Duncan Bay, Gordon Road, Snowden Road and reconnects to Brewster Lake-Loveland Bay Road. For your safety please follow recommended detour routes and watch for increased heavy traffic while driving to the park. Please see attached map for alternate routes [PDF]. For a more intimate camping experience visit Loveland Bay, a small, rustic provincial park that provides camping and boat launching directly onto Campbell Lake. Loveland Bay is a convenient base camp for day tripping to attractions in the nearby communities of Campbell River, Gold River, Sayward, Kelsey Bay and Quadra and Cortes Islands. If you don’t want to leave Loveland Bay’s peaceful setting, you can spend the day water-skiing, fishing, canoeing or kayaking. Or just relax and work on your tan in between dips in the sun-kissed lake. Loveland Bay Provincial Park is located near Campbell River on central Vancouver Island and offers a quiet area for camping, swimming and fishing. The camping area in the park has been upgraded and additional sites, as well as group camping sites, have been added to the park. All campsite and group site reservations must be made through Discover Camping. When reservations are not available all campsites function as first-come, first-served. Loveland Bay is located west of Campbell River on central Vancouver Island. Access is from Hwy 28, 4 km west of Campbell River. Take the turnoff to Elk Falls viewpoint and Loveland Bay. Drive past Elk Falls and over the dam, then take the first road on the left. Follow the gravel road 12 km to Loveland Bay. History: This former forestry site was established as a provincial park in 1984. There are opportunities for canoeing and kayaking at this park on Campbell Lake. Paddlers can set in from their campsite or from a boat launch located in the middle of the campground. Lower Campbell Lake offers good opportunities for trout fishing. Fishing is permitted as per provincial and federal fishing regulations. All anglers should check the current regulations issued by Fisheries and Oceans Canada prior to fishing. Anyone fishing or angling in British Columbia must have an appropriate licence. There is no designated swimming area at this park, however the Lower Campbell Lake offers good opportunities for swimming. There are no lifeguards on duty at provincial parks. There are opportunities for waterskiing at this park. A boat launch for small boats only is located in the middle of the park. A small wharf on the lake also provides tie-up facilities. Boaters are advised that dock space is limited and intended to be available to all registered campers. There is no reserving or holding of moorage space when vessels are not tied to the dock. There are opportunities for windsurfing at this park. A boat launch for small boats only is located in the middle of the park. A small wharf on the lake also provides tie-up facilities. There is no reserving or holding of moorage space when vessels are not tied to the dock. Many boating opportunities are accessible from Loveland Bay on Lower Campbell Lake. Boaters are advised that dock space is limited and intended to be available to all registered campers. While fires are allowed, we encourage visitors to conserve the environment by minimizing the use of fire and using stoves instead. Campfire rings are provided at each campsite, and at the group campsites. Firewood can be purchased from the Park Operator. Fees for firewood are set locally and may vary. To preserve vegetation and ground cover, please don’t gather firewood from the area around your campsite or elsewhere in the park (this is a ticketable offence under the Park Act). Dead wood is an important habitat element for many plants and animals and it adds organic matter to the soil. You can conserve firewood and air quality by keeping your campfire small. Limited burning hours or campfire bans may be implemented. Be prepared to bring a portable stove for cooking. There is one drinking water hand pump in the park, located in the campground. 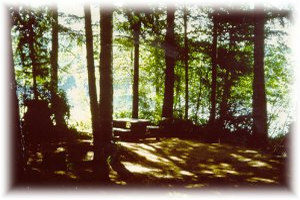 There are 2 group campsites at this park, one at each end of the campground on the lake. Group campgrounds are open from May 1 to September 30. Click here for reservation information. Pit toilets are available at this park. This park offers vehicle accessible campsites, some with tent pads. All the campsites are along the lakefront. Campsite reservations are accepted and first-come, first-served sites are also available. BC Senior’s Rate (day after Labour Day to June 14 only): $11.00 per senior party/night. Read the User Fees Policy for information on Senior Camping Discounts.